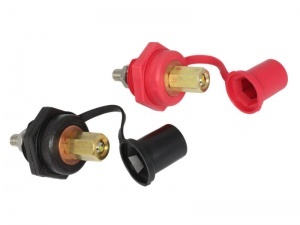 This VTE copper core jumper bushing kit provides a solution to reaching difficult to access batteries by enabling a remote connection for jump-starting, battery charging or power take-off applications. The bushings allow electrical connection through a barrier and can be installed in panels from 1.5 - 9.5mm thick. The solid copper conductivity core ensures very low resistance and provides a maximum current-carrying capacity of 350A. The tethered push-on caps provide full insulation of the connection posts when not in use and the a plastic separator plate prevents accidental shorts between the bushings when connecting up (e.g. with crocodile clips). 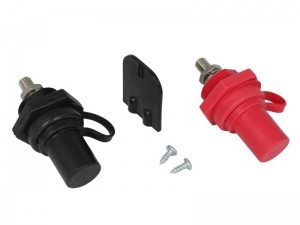 This kit is designed for flush mounting installation in a suitable bulk head or panel and comes complete with red and black bushings, separator/insulation plate (with fixings) and self-adhesive drilling template. 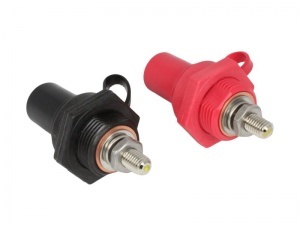 Bushings have anti-rotation flats compatible with 'Double D' punch and die sets and the steel shaft is resistant to high torque generated when tightening large gauge cables. The elongated brass nut on the front of each bushing is for connecting to with crocodile clips but can be removed for a permanent connection to the M10 threaded shaft using ring terminals. Suitable for marine, automotive, commercial and agricultural applications where remote access to the battery is required.